We collaborated with Paradata to build BOM Advantage, a web app designed for visualizing big data in the context of B2B supply chain optimization. This was a big design and technical challenge because we needed to build a robust application that could handle datasets of varying sizes and complexities. After building the sophisticated platform from the ground up, we trained the Paradata team on how to leverage, utilize, and maintain the product on an ongoing basis. The project delivered well over 1,000% in measurable ROI for the client. View the prototype. Build a better way for enterprises to visualize big data for supply chain optimization, enriching users’ bill of materials and providing descriptive and prescriptive insights throughout a project’s lifecycle. Create a robust application that can analyze big data and provide valuable insights by performing many calculations and comparisons behind the scenes, all while preserving performance speed. A sophisticated data visualization application called BOM Advantage, providing users with a highly visual and customizable interface, and delivering over 1,000% in measurable ROI for the client. 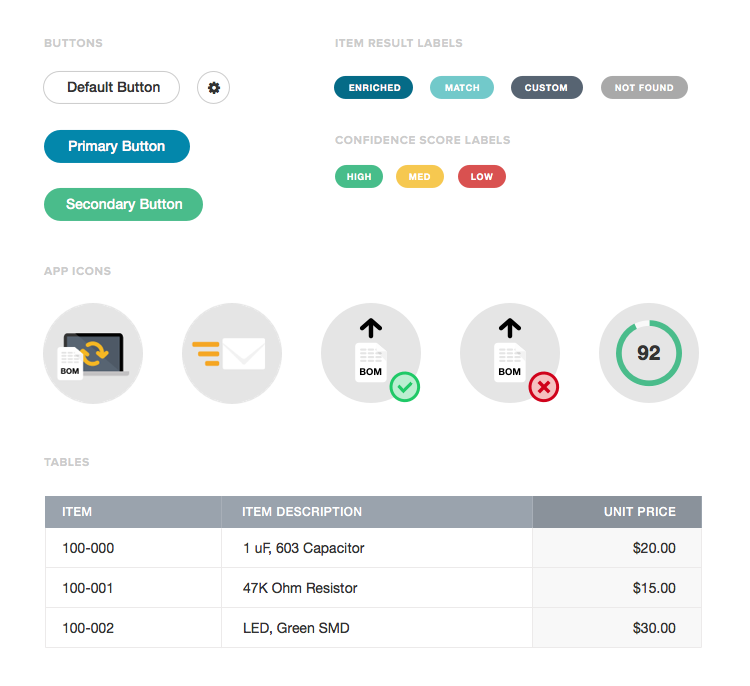 UI elements designed in line with Paradata’s brand. Since we were designing a product that was part of a suite of others, we established a visual style that closely followed Paradata’s brand guidlines. The design elements use brand colors and rounded corners to complement Paradata’s logo. An overview of the project offers insights into the BOM’s overall health. 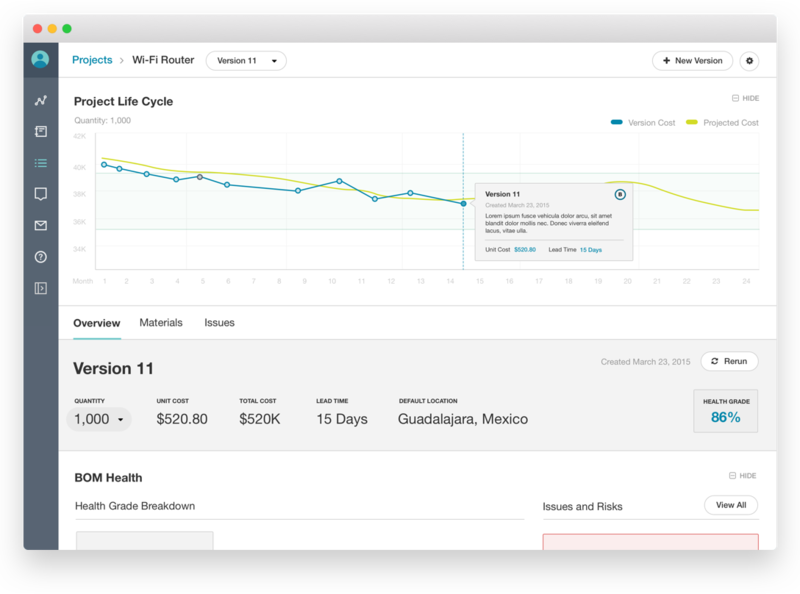 Through rapid prototyping and iterating, we designed a solution that gives users descriptive analysis into the current state of their project, through a highly visual and customizable interface. Data visualizations and widgets in the project overview call attention to key areas of the BOM and offer unique ways of looking at the data. The concept of BOM Health helps manufacturers track their project throughout its lifecycle and encourages them to increase the score by mitigating identified risks. Paradata builds big data analytics solutions that help businesses understand and optimize their supply chain. We worked with Paradata to build BOM Advantage, a web application that allows brands to analyze their bill of materials and gain descriptive and prescriptive insights into their project throughout its lifecycle. 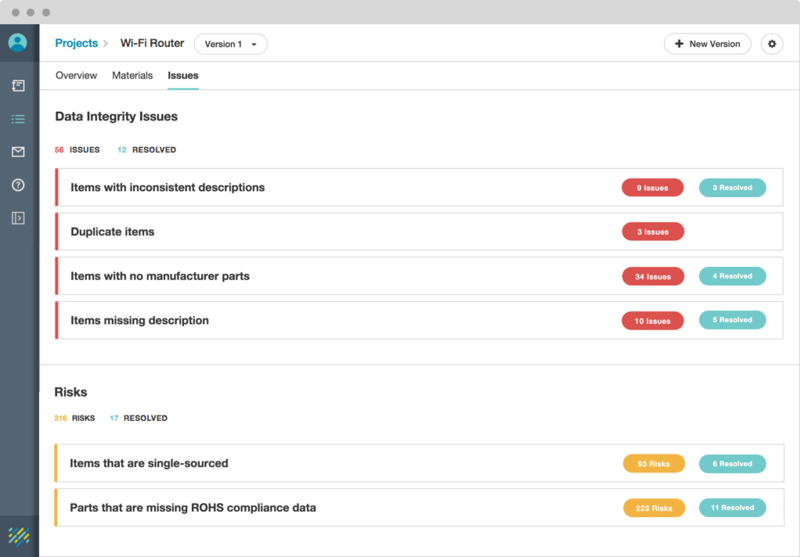 Leveraging Paradata's big data technology, BOM Advantage enriches the user’s BOM (bill of materials) with public and private data and analyzes where users can reduce costs and supply risk. BOM Advantage was a big design and technical challenge because we needed to build a robust application that could handle data sets of varying sizes and complexities. In order to analyze the data and provide valuable insights, we needed to perform many calculations and comparisons behind the scenes, all while preserving performance speed. We also needed to design a flexible interface that could handle dynamic data and edge cases gracefully. With a solid understanding of our users’ needs and our technical constraints, we were able to set goals and priorities for the product. BOM Advantage needed to offer users insightful analysis into their bill of materials while encouraging clean and relevent data. 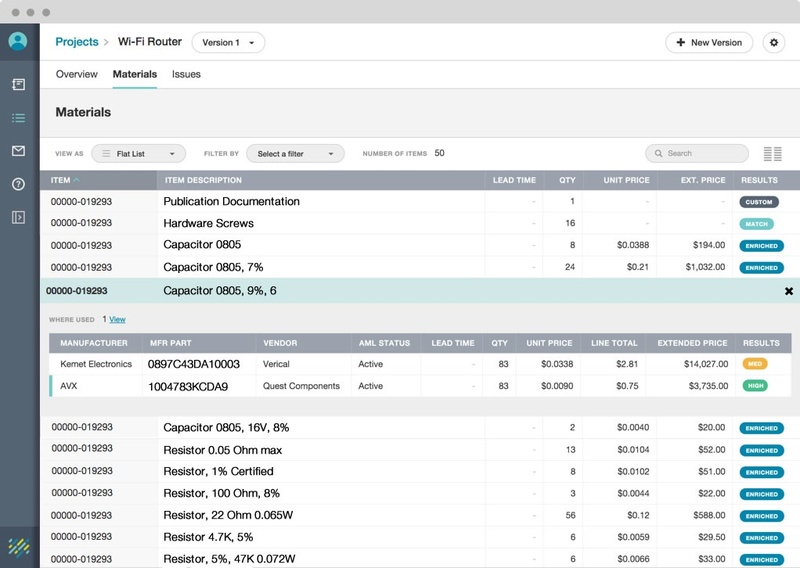 Each of the widgets on the overview page clicks through to a custom configuration of the materials list so users can view their items from that perspective. Multiple views allow users to see how items are used throughout the BOM, and filter and search functionality makes it easy to find items. Users can also customize the configuration of the columns and sort the data in order to focus on certain areas. Various views and filter functionality allows users to view the materials list in new ways. We encountered many technical challenges building BOM Advantage because of its scale and complexity. Performance optimization and security were incredibly crucial since we were dealing with large, sensitive data sets. Thorough planning and defining technical specifications early on in the project were an important step to ensure implementation went smoothly. For our tech stack, we used AngularJS (1.4) with Restangular for simplifying our RESTful API calls. Our back-end was built on Django (1.8), using the Django Rest Framework to create API endpoints. All front-end testing was done in Jasmine with Karma as our test runner. Issues and risks grouped by category. BOM Advantage also leveraged Paradata’s manufacturing expertise and alerted users to issues and risks that threaten the BOM’s health. Data integrity issues helped ensure the data was accurate and clean, while risks warned of items and parts that may eventually be a problem later on in the project lifecycle. Users can click into a category and export a list of issue items. 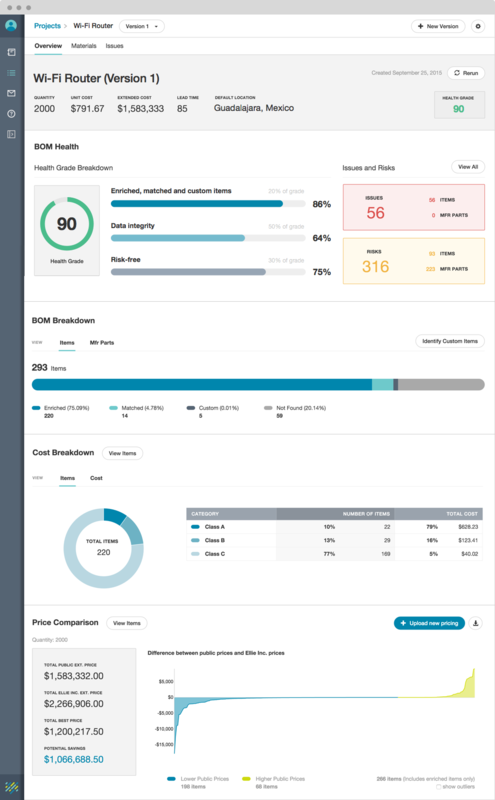 After resolving the issues, users can upload a new version of the BOM and see their health grade improve. We're still working with Paradata as they continue to get funding and build more products. As we test and gather user feedback, we will continue to iterate and further develop Paradata’s suite of products.